New Jersey Flag Lapel Pin is crafted by soft enamel . 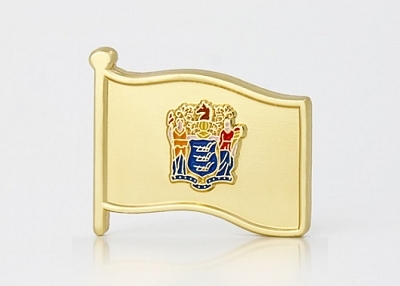 New Jersey Flag Lapel Pin dies struck with gold finish. Each New Jersey Flag Pin is individually poly bagged and fixed by a butterfly clutch back. GS-JJ can provide many different enamel pins and lapel pins at the lowest price. In 1780, during the Revolutionary war, General George Washington directed that the regiments of the New Jersey Continental Line have a flag of dark blue and buff (buff and Jersey blue are now recognized as the official state colors of New Jersey). Three plows on the shield honor the state's agricultural tradition. The helmet above the shield faces forward, an attitude denoting sovereignty (fitting for one of the first governments created under the notion that the state itself is the sovereign). The crest above the helmet is a horse's head (the horse is also New Jersey's official state animal). The supporting female figures are Liberty and Ceres (Roman goddess of grain - a symbol of abundance). Liberty carries the liberty cap on her staff and Ceres holds a cornucopia filled with harvested produce; they are supported by a banner that reads "Liberty and Prosperity" (New Jersey's state motto).